This vehicle is equipped with TPMS. It monitors tire pressure of all tires except the spare. When the low tire pressure warning light is lit and the Tire Pressure Low - Add Air warning appears in the vehicle information display, one or more of your tires is significantly under-inflated. If equipped, the system also displays pressure of all tires (except the spare tire) on the display screen by sending a signal from a sensor that is installed in each wheel. For additional information, refer to “Low tire pressure warning light” in the “Instruments and controls” section and “Flat tire” in the “In case of emergency” section. Check the tire pressures (including the spare) often and always prior to long distance trips. The recommended tire pressure specifications are shown on the F.M.V.S.S./C.M.V.S.S. certification label or the Tire and Loading Information label under the “Cold Tire Pressure” heading. The tire pressures should be checked when the tires are cold. The tires are considered COLD after the vehicle has been parked for 3 or more hours, or driven less than 1 mile (1.6 km) at moderate speeds. The TPMS with Easy Fill Tire Alert provides visual and audible signals outside the vehicle for inflating the tires to the recommended COLD tire pressure. For additional information, refer to “TPMS with Easy Fill Tire Alert” in the “Starting and driving” section of this manual. The Gross Vehicle Weight Rating (GVWR) is located on the F.M.V.S.S./C.M.V.S.S. certification label. The vehicle weight capacity is indicated on the Tire and Loading Information label. Do not load your vehicle beyond this capacity. Overloading your vehicle may result in reduced tire life, unsafe operating conditions due to premature tire failure, or unfavorable handling characteristics and could also lead to a serious accident. Loading beyond the specified capacity may also result in failure of other vehicle components. 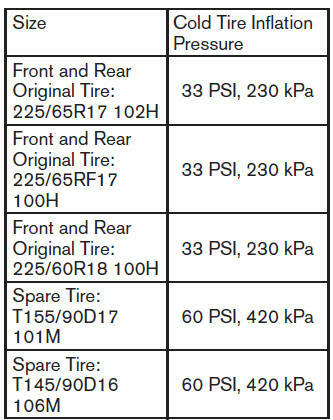 Tire size - refer to “Tire labeling” in this section.